I subscribe to Gourmet’s digital newsletter, and while I often find their recipes and tone too American, I enjoy the quality food writing by contributors on their website, disecting issues around chefs and food on a level where the emerging food culture of South Africa simply can’t compete. Gourmet’s shuttering is symptomatic of the larger struggles facing all manner of publications. As magazines and newspapers are forced to compete against a din of free online content (of inferior quality), they are forced to provide more editorial content with less money and fewer people. In the end, the public is the loser, as the number of talented paid writers dwindles. We have fewer people whose full-time job it is to keep an eye on politicians and corporate executives. In the case of Gourmet, we have fewer talented chefs and writers researching, documenting, uncovering and pioneering the trends and issues of what we put into our mouths and bodies three times a day. I echo Julie’s sentiment in part. I make a living writing about restaurant openings, profiling chefs and tracking food and wine trends. I spend a great deal of time doing that, often partnering with talented photographers to produce fairly impressive layouts on very tight writing and image budgets, for very little remuneration in real terms. Previously I worked in Asia on premier titles, exposed to people who had premium bank accounts funding their gourmet wine and eating habits and I’m not ashamed to say I revelled in it at times. True foodies don’t spend on meals or ingredients for the sake of snobbery, they’re compelled because they have the ability to appreciate flavour equally in a fine dining restaurant or a simple street market stall. I ate an unexpected meal at Bokkie Botha’s delightful The Olive Branch restaurant (Tel 082 892 7222) while in Prince Albert recently. There was such enthusiasm and attention to recipes from treasured cookbooks and great mealtime restaurant experiences that it infused the meal and overshadowed the lack of technical skill in places. 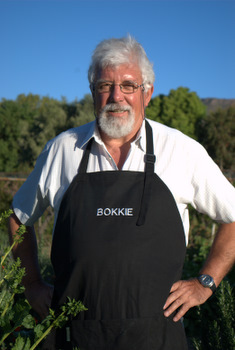 Although Botha is a self-trained cook who opens his Prince Albert restaurant only periodically, this increases demand. And he has more experience than most, eating in and then touring Michelin-starred restaurant kitchens of France and Europe after the meal. It shows in the dedication and love he offers on these country town plates, using a well-intentioned but amateur crew to assist in creating complex dishes. In South Africa it’s been amazing to track food progress since the days of Apartheid when out-of-touch European chefs served tired buffets in local hotels. We don’t have Michelin stars but we have a generation of chefs and amateur cooks who are enthusiastically discovering local produce, the same produce that receives quality thumbs up from visiting overseas chefs. I’ve contributed to plenty of sinking titles in South Africa in recent times. A few printed publications don’t have the history of Gourmet, but we have an exciting food culture we’re still exploring. In the same way that restaurants are reinventing themselves to cope with adjusted dining budgets, I’m feeling positive that serious foodies publications will go the same route in SA, and survive. Anybody agree? Kim - I started reading Gourmet in the 1960s. This is such a tragedy. I did an interview about the closing of Gourmet on ClassicFM today. There was something so reliable about Gourmet. many of the travel articles have led me to anazing places and the recipes to fabulous food experiences. I am really sad. Still mourning the loss, I lived for Ruth's editorials... The calibre of the food writing was an inspiration to strive for better in my own writing. I often admired the brave image choices and art direction. You could place your trust in the recipes, that they would work even when making it for the first time. Intelligent thought was applied to cooking techniques so as to improve them. So devastating that all this and close to 70 years of heritage can be dismissed overnight. I saw the report this morning in the New York Times (I'm in DC at the moment) Conde Nast commented that they felt they had to cut either Gourmet or Bon appetit as their ad revenues were down 40% and the fact that Gourmet has a circ of only (only) 850000 versus Bon Appetit at 1,400,000, they took a view that the market of the future is the middle class.